Big news! I moved. So same kvelling, new kitchen! (I had to point this out incase you were concerned why the fire escape blurrily visible in the background of all my photos has changed colors.) Wait, what do you mean you didn't notice? OK fine. That's not why I'm telling you I moved. This is a sheepish explanation for why this post is lacking the robustness of, well, a full meal. A smoothie? You ask. That barely even requires a recipe. I know this. But let me state my case. This Sweet Potato Pie Smoothie is a great way to ease into the classic, beloved flavors of Fall, without launching into the hassle of an entire classic autumn meal (yet.) With the chilled weather, my mind is screaming pies! roasts! preserves! breads! However, my exhausted-from-moving self (and unpacked boxes labeled "kitchen pantry" sitting, still taped, in the living room) prevent me from wholeheartedly throwing myself into the cooking of the season. So, I present you with a compromise. The delightful flavors of sweet potato pie filling, lightened up. In this recipe, sugary starch, silky soymilk, and warmly spiced cinnamon with a dash of vanilla are all blended together for a drinkable dessert ready in 5 minutes — all without the guilt of a traditional baked good. Indeed, this smoothie packs a mega nutritional punch between the beta-carotene and fiber rich sweet potato and fat-free yogurt, which thickens the consistency and richness without adding fatty cals. 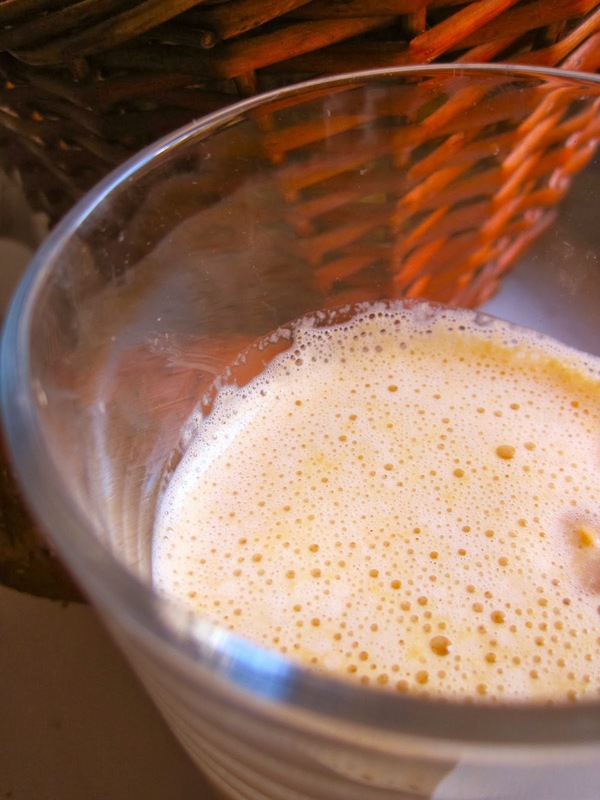 Light soymilk (feel free to use vanilla almond milk instead) adds one last touch of sweet and a cream-like nuance. I was totally obsessed with vegetable juices and fruit smoothies this summer, so think of this smoothie as a bridge between the fresh, liquid goodness of summer and the rich hearty fare of fall. 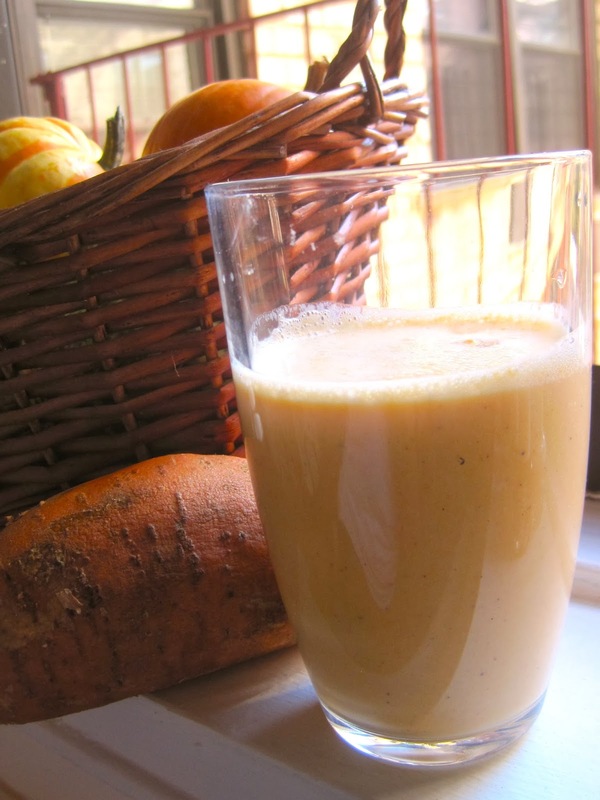 To lighten up the smoothie even more, try cubed butternut squash in place of the sweet potato. Still craving the real thing? Add a "crust" of crushed graham crackers into or on top of your smoothie. *Raw sweet potato can be easily cooked in the microwave. Puncture a few times with a fork, and microwave whole potato on high heat for 4-5 minutes. When a fork easily slides though the flesh, it is cooked through. **If using Greek yogurt, substitute 1/4 cup of yogurt with 1/4 cup extra soymilk to ensure a light consistency. 1. Place all ingredients in a blender or food processor. Blend for about 1 minute, or until smooth. 2. Pour into 2 glasses. Serve immediately. For the first time in history, my staunch loyalty towards Trader Joe's faced the possibility of falter. I have to get this off my chest: I've been cheating my on my #1 grocery store. Oh Trader Joe's, our relationship is so deep (into my wallet), and I've spent so much time with you (on your never-ending lines), but I never thought I'd stray! Until a new guy came to town—intriguing and irresistible, plunked right down next to my Chelsea office. Enter Fairway, novel and handsome with his giant olive bar, massive cheese display, Polar seltzer cornucopia and impossibly soft baguettes—all without the maze of a line that I've spent weeks (possibly months) waited oh so patiently on at TJ's. But as affairs go, I had to come crawling back to the one I love the most, tail between my legs. This Chopped Lentil Salad with Swiss Chard, Tomato & Egg recipe would not be possible without you, TJ. The best thing about Trader Joe's is it's uncanny ability to create time-saving preparations of things you do at home, but don't think could exist prepackaged. Ready-to-serve hardboiled eggs? 20 minutes, back to you. Pre-cooked lentils? 40 minutes into your pocket. Cheap, hassle-free, and incredibly tasty (I could eat those steamed French lentils straight out of the bag), these two ingredients inspired this simple, easy, and QUICK make-for-the-week lunchtime salad. This salad yields full, hearty Fall flavors that you'd never guess required 0 cooktime (because Trader Joe's did it for us!) Obviously, there's nothing wrong with preparing the eggs and lentils the good old fashioned way; I'm just presenting you with a time-saving alternate. The earthy lentils, leafy swiss chard, acidic tomato and mild egg make quite the dynamic combo, and the chopped nature of the salad promises you'll pick up the respective flavors in every bite. The marinade is simple and foolproof: grainy mustard, lemon juice and red or white wine vinegar, and a touch of honey to give the sweetness of the swiss chard just one extra kick. Fresh dill delivers a refreshing, herby finish, plus lots of salty feta to complement the leafy greens. Boasting incredible amounts of nutrients, fiber and protein, this salad remains rich and flavorful (the lentils deliver a lovely "warm" quality) while also extremely nutritious. As it keeps for an entire week, I recommend making it on Sunday night for the work week ahead—I promise you won't get bored! 1. If not using pre-steamed lentils, cook according to package directions. (Same goes for the hard-boiled eggs.) Set aside until lentils and eggs are cool. 2. In a medium sized skillet, heat 1 tbsp olive oil over medium heat. Add chopped scallions and swiss chard (roughly chopped, stems removed) and cook, stirring frequently, for a few minutes until swiss chard just begins to wilt. Remove from heat. 3. In a large bowl, combine the lentils, tomato, egg, feta, and dill. Toss in cooked scallions and swiss chard. 4. In a small bowl, whisk together the lemon juice, red wine vinegar, mustard, and honey. Pour contents of small bowl into the large bowl, and mix thoroughly. Add salt and pepper to taste (plus more feta cheese/chopped dill if desired.) Salad will keep for the entire week. L'Shanah Tovah! The festival Rosh Hashanah—meaning "Head of the Year", or the Jewish New Year—is celebrated largely by eating symbolic foods which represent our hopes for the year to come. For example, we eat a round challah bread instead of a braided one to celebrate continuity and the circle of life, and pomegranate seeds in hope that our good deeds in the ensuing year will be as plentiful as the seeds of a pomegranate. I know I don't have to sell you on the amazing goodness of grilled cheese, but there are so many other ingredient combinations in this sandwich that propel it to a whole new level of yum. Gruyere cheese and apples are one of my favorite snacks, as the smooth, washed rind cheese balances out the tartness of the apple while also cutting it's sweetness. This gustatory balancing act is carried over to the grilled cheese as well- a slight nuttiness of the cheese coupling with toasted walnuts, and a generous drizzle of honey adds a deliciously sweet finish to the pungent cheese—kept in check with thick slices of multi-grain bread. This recipe originally called for any washed rind cheese, suggesting Taleggio, Fontina, or Reblochon; but I stuck with a good ol' cheddar and the result was absolutely delish. I loved how the grilled cheese felt "stuffed" with nutty, tart and honeyed sweetness: wholly satisfying in the present, yet forward thinking for the year to come too. 1. Heat a medium-sized skillet pan over medium heat, and cover with a mist of olive-oil. 2. When pan is warm, add 1 slice of bread and layer on cheese. Cook for a few minutes, covered, until cheese just begins to melt. Add the other slice of bread on top, and flip, cooking until cheese is melted and bubbly and both sides of bread are toasted brown. 3. Remove grilled cheese from heat, and pull apart so the sandwich is open-faced. Pick one half and layer on apple slices, the toasted walnuts, and drizzle with the honey. Add a dash of salt and pepper. Take the other piece of bread and top off the sandwich, making whole again. Cut in half, and serve immediately.